Frankly, a lot of people really have no clue what to do for their website. Others just want to skate by with chump change from Adsense. Some profess that they profit from making money from their ads, but never weigh in the actual time spent and if they really walk away with extra money to spare after all the bills and basic necessities are taken care of at the end of the month. That’s great for those who like to live like that, but what about those who want to do more than skate by? How about, aside from that awesome content, thinking of better ways to organize it and bring it to your visitors’ attention? How about helping your site make more for you, leaving you with a lot more time to spend doing other things like creating awesome posts and engaging with people? My ebook is not here to guarantee that you will make money immediately. It is to get you thinking about making a more effective plan to convert your website visitors into loyal readers, subscribers, and buyers. This ebook is 18 pages and in PDF format. In order to get this ebook, you will need to become a subscriber to the Blondish.net Weekly Newsletter. Once you subscribe, you’ll receive an email with a link to confirm your subscription, and then receive an email with the link to the page to download this ebook. I hope that this ebook will help you understand what website conversion is, and that you use it to improve what strategies you’re using or finally implementing one if you don’t have any plans running at this moment. Nice one, thanks for the free ebook! I haven’t wrote an ebook yet, but better to be prepared for all posibilities. Knowing you this eBook is a real gem. I just “shared” and downloaded it and look forward to reading and following your advice. Terrific timing for me since I just launched a new site. I’m taking it slow this time round because everything about it is a departure from what I’ve done before. Big plans and lots to do in the next few weeks and months so I’m grateful for the opportunity to tap into your expertise. I knew you had it in you to help us get our stuff together like this. I for one will enjoy reading and sharing your knowledge with all my contacts. Most people still will need time to find their rhythm in usage. I think having such a blue print per say, is amazing and gives us a chance to rally expand our interaction with others. Getting our sites to have real interaction with loyal readers is a must and with this information you have created is going to help very much. Thanks for caring to produce such a master piece! I have two ebooks on my site, and I must be doing something wrong because I’ve only sold one. I think traffic is number one, and is very challenging to get substantial traffic, even after writing about 140 articles. Successful blogging isn’t easy. If you don’t love to write, chances of doing it consistently in the face of poor results is grim. It takes more than successful blogging. Marketing is a whole different game as is takes making sure to bring that content to everyone’s attention in some manner. I read your ebook and it has lots of good information on how to convert. I am trying a few methods but cannot be too sure how its working out. Your ebook gives me further ideas to try out. Thanks for creating it. Thanks Shalu… hope it really helps you for your site. Read your post that was amazing with great information. I thing Realizing you this particular eBook can be a real jewel. I simply shared in addition to downloaded this and expect reading in addition to following your advice. Terrific timing in my opinion since I merely launched a fresh site. I am very excited to read through the ebook, since I just created a new site! Can’t wait to see what you’ve written – you’ve inspired me to start writing! I tweeted using the button above – using google chrome – but content not unlocked. Also, fb and g+ not working for me. It should have unlocked… if not… use the contact form and I’ll send the link. Downloaded the eboook and now its time to read it and will surely let you know how it went for me. Thank you for writing this, I just might have to check it out soon. It always helps to get advice from the experts. Thanks for the free ebook, I need all the help I can get! Hello Author a really nice Ebook it helped me a LOT. Thank you. How do you create and apply this “content is locked” thing? I also would like to have such pop up in my own blog. great piece of advice. Very much appreciated content. I’d love to read more posts like this in future. Really helpful Ebook everybody should read it once. Previously I was using Adclickmedia but when I placed Adsense converting becomes Zero . Don’t know why hope this will help me. Nile, checking back to see what is going on with that eBook. The results are getting more people to arrive here, and actually take action for the first time. I have been referring people here, for SEO help and that eBook. I do not allow that on my blog. I use it only for my voice. My site for my company is where I walk people through methods and other things I am sure your eBook has clarity on. Keep allowing us to learn from you. We appreciate all that you do and continue doing. Thanks for sharing e-book. It helped me a lot. Keep sharing such a informative things. Sounds like a great e-book. I will be back to download it. As they say, don’t add another thing on top of what you have until you are done. I have a few more e-books in the pile to read. Thanks for this free ebook. I will surely download this and follow all the tips you have mentioned in this ebook. And congrats you for this ebook. I just downloaded your book and found out really interesting things. Thanks for the awesome info and the social locker for this was worth it. Thanks for the ebook, Nile. I will check it out this weekend. I haven’t been to your site in a while, but it looks like you gave it a makeover. Looks great! Thanks for sharing! Conversion optimiztion is key, its amazing how changing title placement, copy and adding lead capture forms can affect conversion numbers. I am so excited to read this Nile! As a blogger, I think I can speak for the majority of us when I say, we need all the help we can get. Thank you for taking your expertise and sharing it! Great advice in your eBook. This is a topic that we all need to adapt to and always be open to new ideas. I like the share to receive concept! Author is Great. What a nice post for everyone. I am a new blogger and these day’s trying to become a successful blogger with my blog. Many times i feel demotivated and feel their is nothing more which i can do with my blog have your website niche. Then, i visit websites likes your and again start feeling that i have to do something and i start my work one more time. So, i kindly want to say thank’s to you for writing such a beautiful article and keep doing this. As, it’s motivates many new bloggers like me. Thanks Manju! I hope the ebook helps. I know how it was to be a new blogger too. Looks like an informative e-book. Thanks for sharing, although i haven’t taken a peek into it yet. Great book, Niles – many thanks. Loved your ideas on re-organizing and re-classification of ideas. Very good tips. Aussi cet article nous a donnée tous les informations de 10 Raison pour laquelle notre site n’est pas de convertir et comment y remédier. I have also written a e-book but that did not get as much success as i expected. I guess the lack of promotion is also one factor which resulted in this failure. I read your e- book and it has heaps of great data on the most proficient method to change over. I am attempting a couple of techniques yet can’t be excessively certain how its working out. Your e- book provides for me further plans to go for. The whole aim is just converting visitors to customers . I think now I have got ideas on how to fix the problems and start converting.I ‘d surely look forward to visit your website for more information. I really like your article and I really like your writing style. Thanks for sharing it. ! Really nice one, thanks for the free ebook! I haven’t wrote any ebook yet, but now understood the importance of it. Nile, You always provide so many excellent tips on your blog so I know your new eBook will be filled with lots of great advice! Congratulations and thanks so much for taking the time to write this book to help all of us! Awesome work, especially information that you provided is very interesting and very helpful it will help many others like me. I was actually referred to your site by Leslie Denning, Even though I recently joined the biz blogging buzz FB group. And I tried to send you a few questions. I’m definitely going back and read your other posts on SEO as well. BTW, Leslie says you might be able to help me. My theme has a really messed up captcha. And I most definitely losing comment opportunities. Leslie suggested I contact you, in the hopes you may be able to help me select a new theme and get it installed. In any event, thanks for sharing your thoughts on proven SEO principles! 2 years back when i started my blog it was a failure for me now again i have started a new blog and after reading this ebook i am feeling i can definately do it. This is the most interesting topic ever! this is the future of sales. i loved the idea about paying for the e-book with a tweet! very smart, but i did tweet it and can’t find the link to download the e-book. (i really want it). I will be the first to admit that my site doesn’t really convert well at all. I’m going to read your book and put things into practice – hopefully I will be able to turn things around. love your writing style. thumbs up! I have to admit that it is a nice article.I liked the way you write this article,it is really motivating. Thanks for writing this article!!!!!! I am sure this E book for very helpful for bloggers. so we can optimize our blog with help of this. really thanx from the core of my heart. Thanks for your effort with the eBook. However, there is one inevitable consequence of educating yourself and us others about SEO and creating lively, convincing content: there’s only so many readers to go ’round. The more people go online and mutate from passive (readers) to active (content creating) Internet users, the a) less time the latter have to read other people’s content PLUS b) the more content targets a group of readers that grow at a slower pace than the content they’re “bombarded” with. This is an unavoidable statistical phenomenon and a law of nature. And when we look at sports, esp. swimming competitions, we see that with every coach becoming wise to the latest training methods and every athlete training so many hours until no one can train any more and not “outtrain” anyone else, they all end up nearly the same: at the finishing line they are often only milliseconds, sometimes even only thousandths of a second, apart. I believe we will see falling return on investment in the labor of content creation eventually. I took this eBook very seriously, and thanks for sharing such a useful and constructive idea of converting blog. Thanks. I have to say a nice article and helpfull also. I am feeling motivated. Thanks for sharing this article. I am waiting for your next article…. Thanks… You So Much. When joining blogging you might think it will start converting immediately of which it is a deceit. But if you continue blogging diligently and there is no change the it will be high time to apply this tips by Nile. There are many hidden benefits of SEO. Those you please share your wisdom with others you can do it from your iPad with Viber. I’m not yet marketing any service on the web and simply wanted to try out blogging. Hope I could learn a lot from your site though. Don’t even know where to start and why I need adwords, analytics, Alexa, SEO and such. Lol. Thanks for the ebook. One of my websites (been around since 1996) did very well for years, generating a healthy AdSense revenue. However, in the past 5 years, AdSense payouts dropped by more than half so about a year ago, I started to use affiliate ads. The website is very “white hat” but I seemed to have gotten pecked by penguin. Maybe because of the affiliate ads? I’d be curious to hear what others experiences have been. Thanks for sharing this e-book. It certainly looks a great and informative e-book judging by it’s content. Will read and share my experience. Thanks for this Amazing free eBooks and I’ll definitely make use of them effectively. Nice one, thanks for the free nice ebook! I shared it on my G+ account and I’ve downloaded it. I haven’t wrote an ebook yet, but better to be prepared for all posibilities. Thanks for sharing this nice tips here. Wonderful and informative article, Thanks for sharing wit us. I have been lagging with my conversions for years and also have been finding some good information about how to do it right way. And looks like I have found it here! Thanks for this post and free ebook! Downloading it now. Hope it help 😀 Tks anyway. Thanks for the Ebook, given everyone else’s comments it sounds like a great book. I have downloaded it and will read when I get home. i think being successful and making money. I also thing that spending time, putting quality content on your blog is essential when developing a good base of followers thnx for sharing this nice post will share it with my other friends too. Anyway…it was so cool to click the image and get the download. COOL! I am about to read, now. Sorry I left a comment before reading. I know your content is always full of value, and I wanted to make sure you know that before I leave the site for the day. Cool eBook… I guess one question that comes to mind though, is… if you’re running a business with a high-level sell and that’s your primary directive… coming up with ways to get people to come back over and over is a little daunting. I mean, it’s like selling cars. You may get repeat viewers when they’re shopping to buy – but that provides itself. Not sure how you improve on that without getting off topic? Thanks for sharing this beautifully presented eBook, Nile. It is an excellent resource and one that I shall refer to frequently. Fabulous e-book. Some great strategies in here I’m going to implement. Sharing! Awesome post which contains very useful information regarding your e-book. hope it will informative, inspirational and instructive. Thanks for sharing such an excellent post. This article was very helpful without any doubt.Thanks for sharing your eBook for free. It is complete awareness creating post. Most probably these mistakes are happened in every seo web page holder. More likely it can be resolve easily. Really great content. Forward such posts. Thanks a lot for sharing this e-book with us. 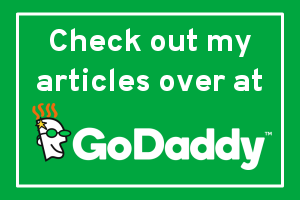 Hope it sheds some light about my site conversion problem in CPA. Thanks for sharing this amazing e-book. I will definitely will follow these reasons. What software did you use to create your eBook? I have been thinking about doing one. Thanks for the great and free ebook. Nice to come across your blog too. Hello Nile, I know I have seen this many times but I really took the time to actually download your e-book. Well tonight is the night , I am still at my sons tonight after a wonderful weekend together and everyone is down for the night. From reading what everyone esle is saying and knowing YOU I am sure I am in for a surprise!! Thanks great way to end my day.. Thanks for the FREE help!! Thank you very much for this free ebook. It’s really help me. I think everyone should read this ebook and other conversion related materials they can get their hands on. I mean, it only makes sense, right? I have started reading this eBook and I have already started to see results. Thanks again!! I’ve downloaded your ebook. I have one affiliate site which I’ve been trying to work out with. But from very long time I haven’t seen a single sell on it. I will surely going to give your ideas a try and hope it will work out. And soon I’ll share my feedback with you. Thank you very much for providing a new direction. 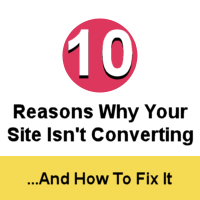 This is a comprehensive e book packed with lots of info to help a site to convert. I picked out a number of reasons that I need to fix for my website. And on top of them all I like the last one- making follow up. Good Article.Its my pleasure to read your blog posts. Firstly, I would like to tell you that the ebook of the site converting is amazing. I was remembering that day when I was searching about how to convert my blog and how to fix it. Today my friend said that I have a blog link where you can solve this problem. So I here after reading your ebook. Truly speaking, this is wonderful ebook. Lots of points are unique, interesting and very useful for me. Drear Nile, thanks for help me. Please note – Respected Nile, May be your spelling if “converting” is wrong in Permalink. I’m making sure that i can follow all the advice given here in the ebook you’ve provided. Thanks for sharing this! Thanks for the e-book this has some great tips in it. 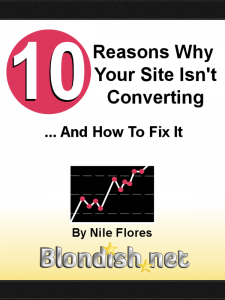 It’s another learning method about eBook: 10 Reason Why Your Site Isn’t Converting and How To Fix It. This is very helpful and useful for everybody. I learned and many great tips here. Thanks for sharing the article. Great post! Great text , you should write more . This information really helped me. I have been spending time as of late going through my old blog posts and updating them. There is so much more to blogging than just writing a post. The technical side like converting pages is probably the most important thing we can learn how to do. Thanks, helpful when my site breaks again, i’m really going nuts with this. Just download this ebook. Going to read this book and implement your methods on my blog. Hope this methods help me to increase my blog conversion rate. Nice e-book there. In my personal experience, a major proportion of the conversion rate purely depends on the design and call to action social engineering. I think , to have a good result in SEO, at first , you must have patient . I’ve develop my site with .co domain. I wonder co. domain will Seo good as .com domain ? Thanks for sharing this Ebook! I can share this to my colleagues. I think it is a fine time I shared this. I noticed I haven’t yet…sorry about that but here I go! just the title itself was enticing. I do want to improve my conversions. I feel like I’m doing all the right tactics but visitors aren’t converting like they use to. I just subscribed and I look forward to reading your ebook! Thank you for the free ebook Nile. SEO has been a topic at the top of my list over the past month and I look forward to reading your views about it. Love your blog! The best way to improve your website is to write engaging content which is quite interesting. The look of the website must be pleasing but unless you offer quality, it won’t be useful. Thx for that, luv your site, soo helpful honey!! Its a great share, I think the conversion is completely depending on the how the writer is able to convince the user. By writing some great content, putting real time reviews, proper placement of action buttons etc. Just ordered you’re eBook. Now to see if I can’t get more conversions. That’s interesting. I’ll try on my blog website and see if it converts more. Thanks. Excited to start reading my Ebook! Thanks. Thanks for putting all the information on an ebook. If all bloggers can do the same like you and create ebooks often, it would be very easy for readers to find the right piece of content they were looking for. They won’t have to get strugle through different kind of blogs for the same topic. Over optimising would result in Google penalisation. Never think its not serious. People consider this as dancing, but the fact is more dangerous. Keep a close watch! Thanks for sharing your ebook. I’m always eager to learn more and I wish your ebook to become my holy grial to skyrocket conversions. Hi Ian! Unfortunately that SEO report off Fiverr probably isn’t worth a thing and will be very damaging to your website. Hello Nile I did start on my e-book last week it is slow going though. I just downloaded yours and I am looking forward to reading and following your advice. thanx for the ebook nile! I just subscribe to your mailing list. I have more than 4k pageviews per day and i’m searching for a way to monetize my content. I hope this ebook will be helpfull for me. Thanks for the free ebook. I have subscribed for the mailing list for ebook & can’t wait for my eyes to read, Thanks for finally implementing the new techniques. Very much interested to know the reasons why my site is not converting and I just subscribed to receive a copy of it. I am looking forward to learn a lot from that e-book. Seems like my story, Working my bones to produce high quality but not getting results. The luck is definitely not in my way. Anyways thanks for this ebook. Gonna read it. I love finding golden nuggets like this across the internet.. This is my first time visiting your website but when someone provides true value like this it’s a sure fire way to keep me coming back!! Great work and I look forward to the future! Besides not being converting i am also not getting enough traffic to my blog. please look at my blog and pleas help. That is very expensive for me. Can you please offer me some discount ? I’ve already downloaded a couple of ebooks claiming different tactics at this topic. I’ve subscribed here, lets see how useful your guidance is going to become for my blog. I just grabbed a copy of your ebook. Seems like a great ebbok to read and learn. Will definitely have a check of this ebook. This is a great help for newbie bloggers by sharing your experience. Thakns Nile. Downloaded the ebook and i would hope it will help me with my conversions. Definitely some good tips! You can have all the traffic in the world but without conversion – you aren’t going to get anywhere. Thanks for sharing! This ebook is not here to guarantee that you will make money immediately. It is to get you thinking about making a more effective plan to convert your website visitors into loyal readers, subscribers, and buyers.